Our art group is called Create and Talk and has been running since 2016. It is run by peer mentors and recovery practitioners with lived experience of mental and social health problems. 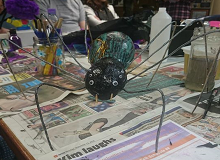 The aim of the group is to help people improve their social confidence whilst engaging in an interesting art and crafts based activity proven to be therapeutic for your health and wellbeing. We have done a range of creative activities in the past such as book folding, toy making, yarn dolls, painting, pot decorating, drawing and we are always open to your suggestions. Our programme evolves around your interests and needs so even if you feel you have no talent, it is the taking part that counts, so come along and have a go! As with all our activities, if you need some extra support to attend, we can arrange for someone to meet you before the group so you don’t have to walk in alone. Alternatively if you want to ring up and talk to someone so that you know what to expect on the day, then that’s fine too. We are here for you, however you feel , so just let us know what you require.